Very charming one story 4 Bedroom / 2 Bathrooms Home with updated Stainless Steel Appliances, Granite countertops in Kitchen; updated light fixtures, plumbing fixtures and door fixtures. All wood floors in bedrooms, Family room, Formal (living or Dining).Deck in the backyard perfect for relaxing or entertaining guests. 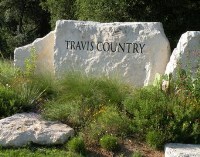 All this Located in the popular Travis Country Subdivision. This updated one-story home in the older section of Travis Country has everything you're looking for. Sitting on a corner lot with a side entry two-car garage, this four bedroom home has plenty of room. Two large living areas and comfortable dining and kitchen area, make this a great home. Newly added back deck is perfect for entertaining. Community pools, parks, pond, trails, tennis and basketball courts are excellent. Warm and inviting home in the heart of Travis Country. Beautiful stone home on spacious wooded lot that backs to greenbelt. Lovely hand-scraped hardwood floors throughout all the main rooms and bedrooms, tile in both bathrooms. Upgraded kitchen with granite countertops and stainless appliances. Spacious master suite with double walk-in closets. Entertaining back yard with inviting stone patio. Stop by for a visit so we can welcome you home! Beautiful home in Travis Country on corner lot with giant trees and plenty of upgrades. Backyard entertaining area includes; covered outdoor patio, heated pool, hot tub, built-in gas grill with counter space, giant weather-proofed TV, and drought-resistant landscaping. Granite counters, recently replaced stainless appliances, huge walk-in pantry, separate office, durable and beautiful seagrass flooring, designer colors and brand NEW roof coming. Fantastic community with parks, pool and trails. Spacious, warm and inviting home in desirable Travis Country. Beautiful scraped hardwood floors on main floor, updated kitchen with granite conters and travertine backsplash. Travertine floors, neutral colors throughout the house. Well landscaped backyard with areas to entertain the entire family. Neighborhood amenities include: swimming pools, hike and bike trails, duck pond, tennis/sports courts and playground. Stop by for a visit so we can welcome you home!